There's no need to pay a premium for those little cans of evaporated milk. You can make your own in two minutes or less. This homemade version works just as well, and it doesn't require you to store all those cans. 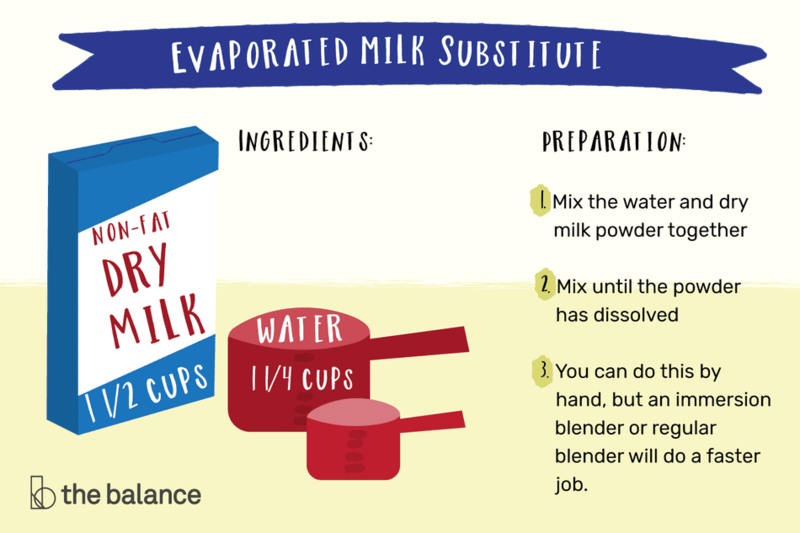 Mix the water and dry milk powder together until all of the powder has dissolved. You can do this by hand, but an immersion blender or regular blender will do a faster, more thorough job. Use your homemade evaporated milk in place of the evaporated milk called for in any recipe. You won't notice any change in your recipe because this makes the real deal. Yield: 12 ounces (1-1/2 cups). That's the equivalent of one can of evaporated milk. If your recipe calls for less than a can, here are some great ways to use up the rest of your substitute. Of course, it's also quite easy to halve or double this recipe, so you only end up with what you need. Wondering If the Powdered Milk in Your Pantry Is Still Good? Here's how to tell. Evaporated milk is simply fresh milk that has had about 60 percent of its water content removed, and that's exactly what this recipe will give you. Just keep a box of powdered milk in your pantry, and you won't have any need for those little cans any more. You can also use powdered milk to make your own sweetened condensed milk, which is basically just evaporated milk that's been sweetened with sugar and a bit of vanilla. If you add a container of powdered buttermilk to your pantry, you can even mix up your own buttermilk. It works just like regular powdered milk, and allows you to make up just what you need, so there's no waste, and no need to keep a bottle in the fridge. Look for it at the grocery store near the regular powdered milk. Saco is the most common brand, and it comes in a canister with a red lid. If you aren't able to find it locally, you can also order it online. My latest and greatest find? Powdered heavy cream. Just mix it with water, and stick it in the fridge the night before you need it, and it'll be ready to use the next day. It works well in baked and cooked dishes, but doesn't whip like fresh cream. You'll still need to real deal for that. Before you go, take a second to bookmark or pin my complete list of ingredient substitutions. It's sure to save you more than a few trips to the grocery store.